Detail of handle and spout. Earthenware jug of molded form with complex handle. 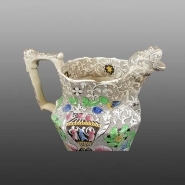 The spout is modelled as an animal head; the contents of the jug had to be poured through the open mouth. The jug has a brown sheet pattern with a background of conventional scrolls and flowers and with a vase and panels of classical motifs. The print is painted over the glaze with enamel colors in yellow, pink, green, and blue. The base has a brown printed mark which includes the initials D&S and the number 21. The number is likely to be the pattern number as this design and mark appears on at least one jug of a different shape. The initials have been associated with at least two manufacturers and for a discussion of this please check in the Who made it section.